This morning all 53 students headed off on their way. Congratulations Spring 2015! Here are some reflections from the final week. Last night proved the saying “the party don’t start ‘till we walk in.” Arriving at conch fest around 4:35 we were the first ones to occupy the fair ground in Deep Creek. After a day of pouring rain, the grassy area sloshed under our feet. We decided to walk up the street for a little bit of puppy TLC. There is a house behind the local drug store Jemmaks that is home to seven or so puppies who have provided much enjoyment to Island School students over the past couple weeks. By the time we all finished loving on the little bundles of fur, Mooch (the famous) had set up her booth. The interesting albeit ironic thing about conch fest is that the Island School and CEI profess strongly that conch should be given up in favor of a more sustainable fishery. Because of this, CEI had a booth dedicated to promoting lionfish consumption. Lionfish are highly invasive in this area and are both sustainable and delicious. In addition, one of the Community Outreach projects that was presenting at the festival was Destinee’s trashion show. The show featured Deep Creek Middle School students, Island School students, and faculty alike. I have to say, I was highly impressed by what Destinee was able to create with chip bags and Caprisun pouches. We left the festival early to prepare for the half marathon the next day. What a way to end the semester: trashion, fried food, and exercise. I grew up hearing all about grown ups and work and the “real world.” It has all seemed so far off; but it wasn’t until I was sitting in a conference room with four of my peers, blankly looking at this project before us, that I realized “real life” was staring me right in the face. The task was to design a renewable solar energy system for the new Anderson-Cabot graduate hall. This design had to consist of an energy audit, schematic, financial analysis, step-by-step guide to what would be produced and how, all thoroughly explained and justified in the format of a professional written proposal. Group dynamics were rough; with so much to do and no idea where to start, heads were butting and emotions were running high. It took awhile to get our ideas off the ground. But the reason there was so much frustration was because we were all so passionate about the project and truly wanted to do the best job we could. With 3 5-hour class blocks, we spent a total of at least 18 hours, not even including the hours put in outside of class. I realized that simply sitting down and getting it done would not be a possibility. It was a long two weeks of a lot of mistakes, a lot of compromises, and a lot of disappointment. But thankfully, we ended up with more successes than failures. Deadline day came and we turned in a completed 24-page proposal, followed by a 5-minute pitch to our peers, faculty, and even the family who donated the money for the building. Hard work doesn’t even begin to describe what we did, and accomplished doesn’t even begin to describe how we feel now. It goes to show that we truly are capable of anything we set our minds to- just one example of many showing how The Island School pushes you to be your best, and to explore the endless potential we didn’t know we had. On Thursday night we went to bed, just the 52 students and few teachers that live on campus. After a good night’s sleep, we awoke on Friday to find that there were suddenly over a hundred people in line at the dining hall. 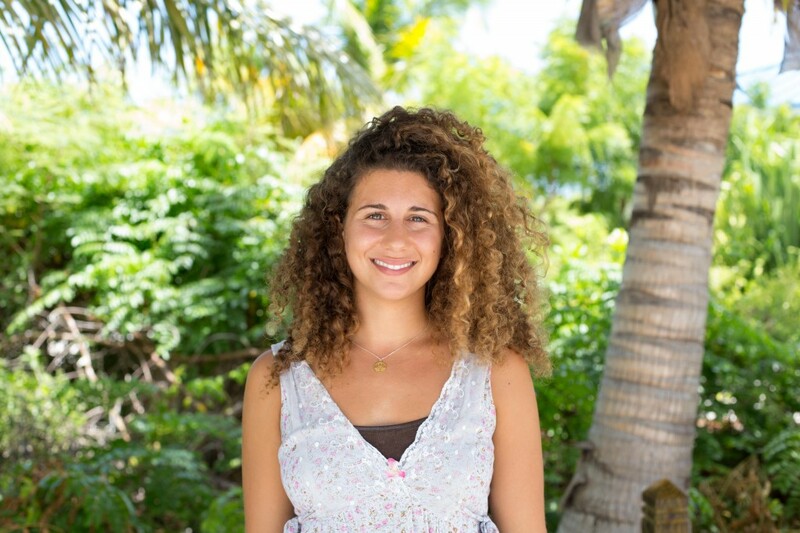 This semester, Island School had the honor of hosting a large youth summit on the issue of plastics on the weekend of June 5, or World Environment Day. 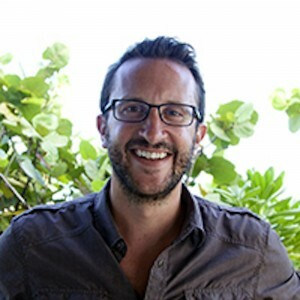 The guest list included a number of Bahamian schools, members of the United Nations, Celine Cousteau-Jacques Cousteau’s granddaughter, 5 Gyres, Bahamas Plastic Movement, the Bahamian Minister of Education, and a few other organizations and important individuals dedicated to reducing plastic use. Oh, and there was this guy named Jack Johnson, whoever he is. Friday morning started with presentations from the preeminent scientists and researchers in the field of plastics and went on the ceremony where Jack Johnson was officially named a goodwill ambassador for the United Nations Environmental Program. He went on to play a few songs…and wow. He sounded exactly like his recordings, and he did it all with a laid-back ease. The next event on Friday was the dedication of the new Anderson-Cabot Grad Hall, where Maxey, Aaron Schultz, and the Bahamian Minister of Education honored the Andersons and Giant, the architect of the actual grad hall. The grad hall will serve as housing for grad students, interns and researchers that come through CEI. On Saturday, we had our culminating project for research, where we displayed all of our work in a way that would reach audiences from toddlers to scientists. My group presented our poster, but we also had a slideshow with photos and videos and we designed and constructed two games. Research has been incredibly fun, but it was a relief to finally be done with our projects. Today, Sunday, the Plastics Summit came to an end with a bang. We all biked down to the marina for lunch, and were greeted by a local band called the Rum Runners. After we finished our meal, we got a special treat. Jack Johnson then performed for us, with the help of some of the crew of the Mystic, the ship he sailed in on, the Rum Runners, and even two Island School students (shoutout to Lily and Hal). This whole weekend was pretty surreal. There were so many impressive individuals, from scientists to politicians to musicians to professional surfers (who just stopped by today to say hi and join Jack Johnson). I hope that this summit and the relationships that we built during this weekend will last on to further semesters. Cole, Derece, Ethan and Olivia. Last weekend, Peter Z pulled four of my fellow Boys Dorm residents and I aside. After breaking a rule earlier in the semester, we were due for a punishment. At the time this punishment seemed like the end of the world. I was terribly angry at my early-in-the-semester self for having broken a rule. 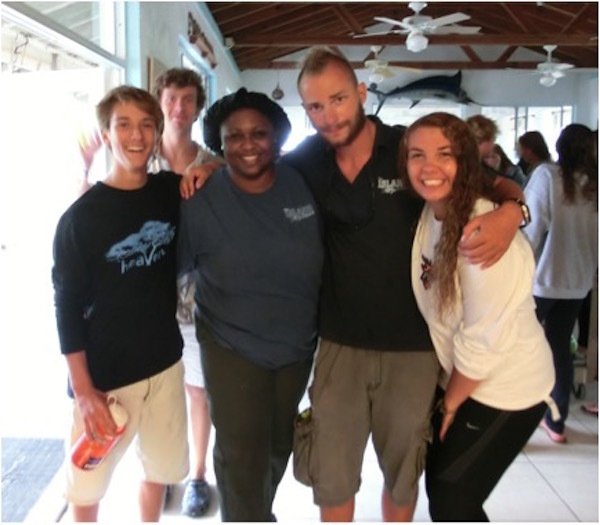 In my mind I had lost 10 hours of my Island School Experience. But The Island School is full of surprises; it finds a way to make punishment one of the outstanding experiences of the past week. On the Sunday after exploration there was a free afternoon, exploration from 1:15 until 6:00. It was the first of my three days of punishment. I can imagine the frown that must have been on my face as many of my friends rode past me on their bikes off campus. Our first task was to move dozens of chairs from the dining hall across campus to CSD. After a few sweaty trips, we ran into facilities team member Arlington. Arlington lives in the nearby settlement of Rock Sound, and is recognizable by the tower of dreadlocks that he hides underneath a red, green, and yellow column of cloth and his warm demeanor. Immediately recognizing our struggle, Arlington offered to give us a helping hand. He made time in his day to bring his flatbed truck around to the dining hall so we wouldn’t have to carry more chairs. This first task became a few truck rides, mixed in with conversations with Arlington about life and morality. For the next three or four hours, we were scheduled to help out the kitchen staff. For me, the first hour of this period was really hard. For all that time, I was hunched over scrubbing mold from a brick corner of the dishes area where faucets fill up dish buckets. As I worked up a bit of a sweat and got my elbows dirty, I had some time to really reflect on what I had done wrong. After we were done with the dishes area, Mooch (our head chef) surprised us with some leftover corn fritters. We shifted our efforts to helping our beloved kitchen staff members Mooch and Derece to organize the walk in fridge and freezer. While we worked, everybody’s mood improved. Mooch and Derece started acting goofy, then we started acting goofy, then everybody started laughing and joking as we worked. Although we see Mooch and Derece are around campus a fair amount, I felt like I hadn’t had the chance to really get to know them. During this punishment, I got to see a side of them that I had no idea was there and that I’m so glad I found. When we finished our work it was about 4:00- there was 2 hours to spare. Instead of going back to Boy’s Dorm, us five boys stayed in the kitchen. We lost track of time as we joked and gossiped with Mooch and Derece over leftover cheesecake and mangoes. I can honestly say it was one of the most hilarious hangouts I’ve had in a long time. As the culprit, it can be tough to take a step back and appreciate disciplinary action. But The Island School managed to make punishment hard enough to provoke healthy reflection about my rule-breaking attitude while at the same time making it a meaningful experience. Losing Exploration Time for me was not the same as wasting time at The Island School, it was a time for me to further explore a part of The Island School that I had not yet grown to appreciate. Marina Cut, just adjacent to the Marina, was just opened up this week, meaning that Island School students are now permitted to jump off the low bridge and float down current cut (with facility supervision of course). So, now that the cut is now open, I was so excited to take my turn floating down the lazy river. My advisor, Flora Weeks, was kind enough to supervise a group of girls who all wanted to jump off of the low bike bridge and swim in the current cut. As soon as classes ended at 4:15, I ran up to girls dorm to change into a bathing suit, then I jumped on my bike and peddled towards the marina. Before hopping in, I decided to make a quick marina store stop and buy an ice cream. After, I walked towards the cut and dangled my feet over the crystal clear water while enjoying the cold ice cream in the heat. After I had watched three or four people jump off, I decided that it was my turn. So, I grab my mask and snorkel. Just before jumping off, looked over my toes which hung over the edge of the bride into the vibrant blue water. The hue of the water was incredible because as a man made cut, it is very deep in the middle but quickly gets shallower on the outskirts. I counted down from three, held my breath and took one huge leap off the bridge. Submersed in water I opened my eyes, remembering I had a mask on. I left the strong current float me down the cut as I watched the wide array of life swimming past me. To my left, I saw a cluster of mangroves that provided habitat for many small and colorful fish. Looking down, I saw a large ray gently gliding along on the bottom of the floor. So, I decided to hold my breath and dive down to try to get a better view. It was so incredible to see a ray so close; I got so excited under the water that I had to come back up for air. Continuing on my way, a little further down, I saw a huge nurse shark swimming in my direction. At first, my heart jumped a beat at the sight of such a large shark, but I quickly remember that nurse sharks pose no real threats to humans. So, the shark and I swam along side each other for what seemed like hours. But suddenly, the nurse shark darted out in front of me and then turned around to face me. He started to rise up to my level in the water and as he swam closer, I realized I should probably get out of its way. So, I dove down and let the shark swim over me. After, as I looked back it its dorsal fin swimming away, I was in complete awe. Hopping out of the water and walking back to the bridge to do it again, I was so completely amazed at what just happened. Exactly how it sounds, one of the sickest thing that has been done all semester. Meet at the boathouse at 7:30 and get on the boat. I was really excited and have been looking forward to this dive for a long time. When the sun was going down and we were on the water the adrenaline was kicking in. I buddied up with Whit for this dive and I could tell that he was real excited as well. As we sat on the boat anchored up over tunnel rock we waited for it to get real dark. Then we jumped in. When we started to descend there were jacks attracted to the light and would come inches away from running into us. When we got down there it was like nothing else, wherever I shined the light that’s all I could see, the rest was just pure darkness. We made our way down to the bottom and I saw this huge figure underneath some rock so I went a bit closer to take a closer look, it was a 5-6ft turtle sleeping underneath this coral. I immediately swam after Nick tapped him and did the awkward turtle and pointed to it and his eyes lit up along with everybody else who could actually see it. After looking at this turtle for 10 minutes we went out off the coral a bit. We shut off the all the lights and Nick took a handful of sand and threw it up but all I could see in this pitch black area was a bunch of these little green lights, it was something I had seen in movies and films on TV but I had never thought I would get the experience of actually seeing it with my own eyes and it was beautiful. I sat there throwing sand up in amazement looking at these bioluminescents. After this we went up for our safety stop and went up to the surface. Once everybody surfaced everybody started freaking out cause they were so stoked off what they just experienced. Everybody was telling everybody what they had just seen. We got on the boat and got everybody else up and got ready to go back to campus. I sat there with my buds looking at the starts and looking at the bioluminescents lighting up the white water on the side of the boat. It was like something out of a movie and that is what The Island School is all about, experiences like those. 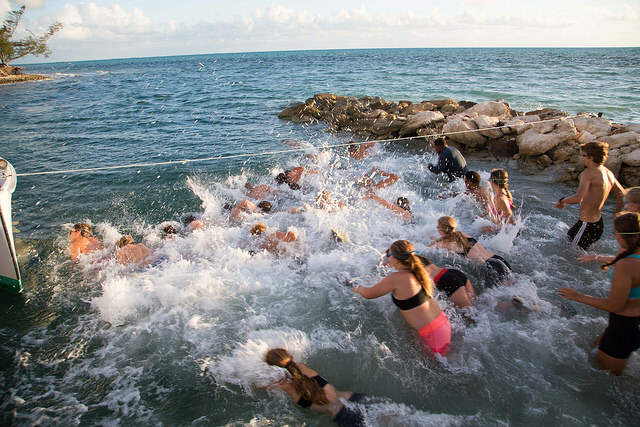 Students dive into the water. Before coming to the Island School, I was a terrible swimmer. I didn’t really know how to do any strokes, and I was pretty sure I would drown in the super swim. Despite this, I chose to go with swim track. I knew I probably wouldn’t get another opportunity to work out in the ocean every morning, and also I wouldn’t get hot and sweaty in the water. After learning how to do freestyle, and the correct way to breathe, I began to enjoy swimming. The day when the current pushed against me so that I wasn’t moving at all was hard—but swimming back being carried by the current was great. Running to Triangle Cut is still challenging, but getting in the water and swimming a lap and realizing you had a shorter time than the last time makes up for it. So there are ups and downs. I’m still not a very good swimmer. But I’m actually kind of looking forward to the 4 mile swim—and I’m confident that I won’t drown now! 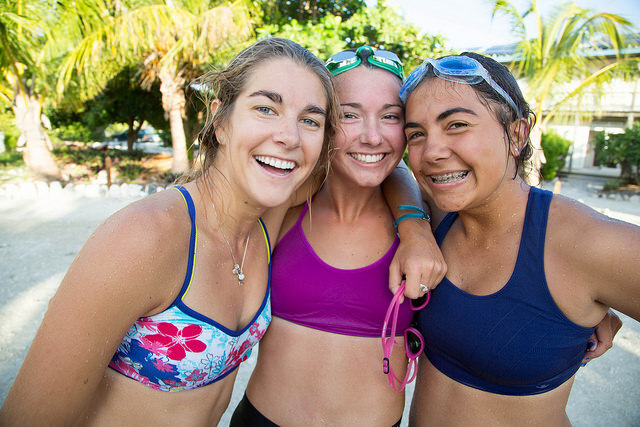 Beth, Ellie and Lily are all smiles after a recent run swim.